The TraffiCalm Street Series of Speed Indicator Signs offers an economical and simple solution to help increase driver speed awareness and road safety on community streets. This pole mounted sign features bright 12” characters which can be seen from up to 600’ away, and help increase driver speed awareness on the neighborhood streets where so many small accidents occur every year. TraffiCalm Value signs are designed for situations where drivers need to simply be alerted of their current speed but the additional data collecting and screen programming capabilities of the iQ Series of Driver Feedback Sign is not necessary. Value signs also come with a complete 20w solar package allowing them to be installed in locations where access to power is an issue. 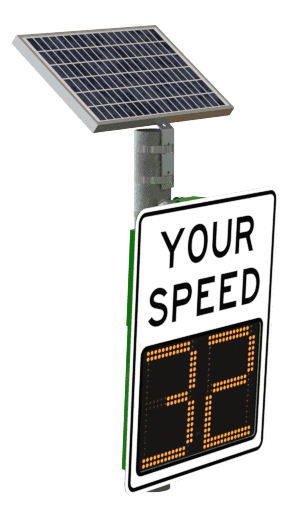 Package Includes: Speed Indicator Sign, mounting bracket, 20W solar package with MPPT charging, installation and user manual.